Coasters are a unique fundraiser that are a little bit different. They are easy to design and make a great accompaniment for mugs. Our simple system for producing these products give the children freedom in their designs. Fill in the form further down this page. Over the years we have seen some great designs. Coasters are something a little bit different and offer you something new you may not of tried yet. We have seen many nurseries in the last few years creating coasters which are great for Mother’s Day and Fathers Day. They are a fairly cheap option and make a great talking point in your house when people come around to visit. 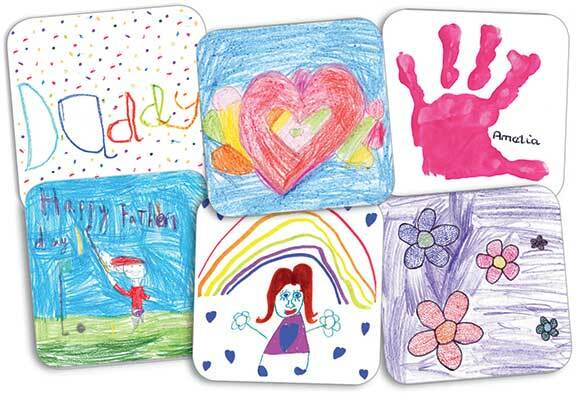 Coasters are very popular with younger Primary School children. They often accompany mug designs, especially around Fathers’ Day! We also offer coasters via the code number on the back of the Christmas cards. All printed in full colour. Each coaster measure 9cm x 9cm. To Qualify for FREE Delivery 25 or more units must be ordered. £8.50 flat rate delivery cost if less than 25. Delivery of coasters is usually made within 2-3 weeks from the receipt of your art pack. I’m sold on Coasters – What do I do Next? If you would like to go ahead you need to order the art pack by filling in the form below. The pack has everything you could possibly need to complete a project. It is designed to be simple and easy-to-use. It includes drawing templates and a FREEPOST return label as well as instructions for both the organiser and teachers as well as an order form! We can also use the designs from the Coaster template to print onto our Teddy Bears. Please see the Teddy Bears page for more information.